So most of you know about Armed Citizen Network (and if you don’t, you should if you carry. They’re the people who will come to your aid if you get jammed up in a righteous shoot.) Anyway, they have people put things on GunBroker to bid on from time to time and they get the proceeds. Right now they have a Crimson Trace laser for J-frames on auction. Well, DeSantis put a custom gun belt and holster up. Made of sting ray leather. It included the belt, holster, and a magazine carrier. The minimum bid was $550. So for grins I put in $550. Guess what - I won! Had to do the usual stuff about contacting the right people and paid my money to the Armed Citizen Network. Then I had to give my belt length to the guy at DeSantis. It came last Tuesday. It is really nice. It is basically black but has this white accent on the holster and the back of the belt. You can wear the belt just as a nice dress belt though it’s still a bit stiff. Each piece came in a nice black bag. I was impressed. It will take some time for the Sig 239 to mold the new holster correctly to it, but I expected that. I may have to use some warm water to help it along. But considering that I spent close to $300 for the Mitch Rosen holster and mag pouch, the latter of which doesn’t really work that well, this is a good deal. When I get a chance I will try to post some pics. Thanks CF. I’m really pleased with it. 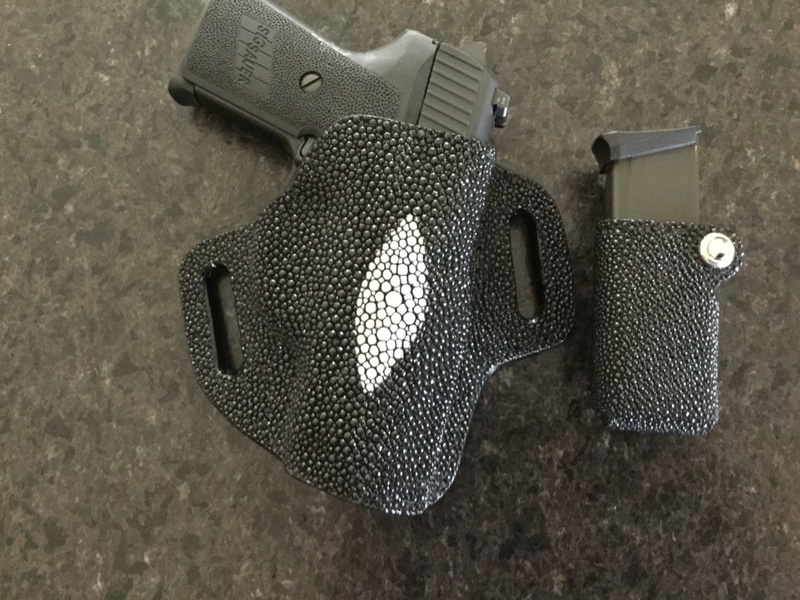 Is it going to be a Bar-B-Que holster - or for everyday wear? Makes me want to properly accessorize my Smidt und Vesson 1911 in high-polish SS. May have to get those "Damascus" G10 grips... to do it justice. Well, I wore the belt only today. I am working on both the 239 AND the holster. It's tight. And I'm still not happy with where the barrel fit is for the BarSto .357 Sig barrel I have for it. I believe it needs some more "adjustment".